On Monday I, along with Lauren, Devon, Georgina, Kat and Carla, took a trip to the Yours Clothing headquarters in Peterborough. As Georgina, Lauren, Kat and Carla have already written thorough posts about the events of the day, I won't go into it too much! After meeting up at the train station, we met Leigh and were taken to Yours Clothing where we were given a yummy lunch and some background information about the company. The entire day was wonderfully informal and it was great to sit and chat about something we're all invested in. We took the time to describe our blogs and our inspiration for blogging and it was lovely hearing the different stories behind them. After spending the majority of the day discussing everything relating to plus size fashion, Leigh showed us around the warehouse and we got to play dress up with the clothes! Overall, I thoroughly enjoyed myself! 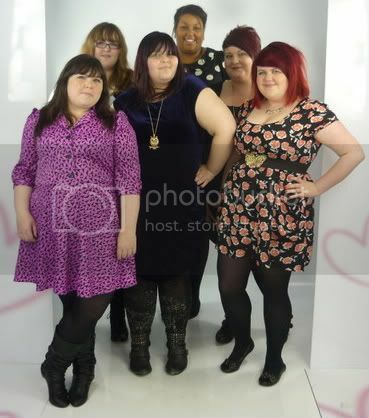 It was great to find out that Yours Clothing is as passionate about plus size fashion as we are and seem to be in agreement about what we should expect from retailers. Leigh was open to ideas about the future of Yours and was enthusiastic about working with the blogging community. There was even mentions of opening a flagship store in London, so fingers crossed! I really hope they do open a store in London! I've been to their store in Nottingham years ago. @ amonkeyfatshionista - I was unaware they had any stores, so I'd definitely make the effort to check out their flagship, if one opened! yours have just opened up at store in manchester as soon as i can get enough carsh together i'm off to have a nosey round! i would love to go on one of these lovely blogger event things they seem like so much fun!